Here’s one good thing you can say about October: It’s almost finished. The S&P 500 is in the midst of its worst month since early 2009, down almost 9 percent since the end of September. That includes a 4 percent drop last week as waves of bearishness swamped potential interest in quarterly results. But it’s not as though the numbers were much to write home about. Major techs like Amazon.com (AMZN), Alphabet (GOOGL), Advanced Micro Devices (AMD) and Texas Instruments (TXN) fell after missing estimates. Industrials like Caterpillar (CAT), 3M (MMM) and Stanley Black & Decker (SWK) crumbled on worries about China and prospects of a weaker economy. Oil also slid to a two-month low as crude-oil inventories grew. And just for good measure, a string of monetary officials rammed home their plans to keep lifting interest rates. No sympathy from the Federal Reserve! All three of the major indexes are now below their 200-day moving averages for the first time in 2-1/2 years. 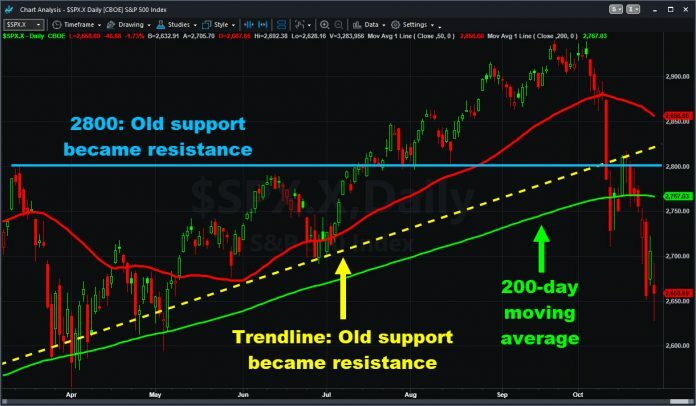 The selling marked a continuation from earlier in the month, accelerating as old support zones became resistance and bearish triangles broke to the downside. While every sector fell last week, economically sensitive groups fared worst. Energy dropped 7 percent, industrials slid 6 percent and financials lost 5 percent. Safe havens like real-estate investment trusts and consumer staples fared the best. Debt-laden natural gas firm EQT (EQT) was the S&P’s biggest loser, hammered 30 percent on weak earnings. Former dental high-flier Align Technology (ALGN) was the second-worst performer, slammed 26 percent by a disappointing outlook. Still, there were winners: Software maker Cadence Design (CDNS) rallied 13 percent after profit and sales beat consensus. Twitter (TWTR) showed signs of gaining traction with advertisers, lifting the social-media firm 12 percent. The biggest economic report of the week, third-quarter gross domestic product, actually beat estimates. But other reports like new-home sales, rail traffic and Euro Zone business sentiment were much less positive. Traders may also want to keep an eye on junk bonds as some big funds probe long-term lows. Further downside in those securities could weigh on leveraged companies - especially in the energy sector. This week features slightly fewer earnings than last, but makes up for it with big economic reports. Personal income and spending get the ball rolling today. In addition to snacks giant Mondelez (MDLZ), some firms in ailing sectors also report earnings. That includes chip-supplier KLA-Tencor (KLAC) and debt-laden oil servicers Weatherford (WFT) and Transocean (RIG). Tuesday’s packed with European economic growth, U.S. consumer confidence and a product rollout by tech giant Apple (AAPL). Pfizer (PFE), Facebook (FB), Mastercard (MA), Coca-Cola (KO) and MGM Resorts (MGM) lead the earnings parade. General Motors (GM) rolls into town on Wednesday morning, along with ADP’s private-sector payrolls report and crude-oil inventories. Thursday’s got AAPL earnings after the close, initial jobless claims and the Institute for Supply Management’s manufacturing index. Starbucks (SBUX) also reports. The week concludes Friday with non-farm payrolls, plus earnings from Alibaba (BABA), Exxon Mobil (XOM), Chevron (CVX) and Seagate Technology (STX). This article was written by David Russell, TradeStation Securities, Inc., part of the Monex Group Inc, published on 29/10/2018.